A columnar plant with small, shiny, dark green leaves. 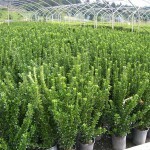 A good plant for hedging or for a narrow screen. It is widely adaptable to many soils, from wet to dry, as long as they are well-drained. It withstands heavy shearing if needed. Introduced by the U.S. National Arboretum.